I saw on someone's blog (I'm ever so sorry, I have no memory of who's post it was, I must have been very sleepy when I read it!) 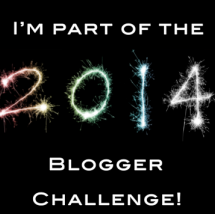 that they were doing the 2014 blogger challenge, as hosted by Gaby of Another Girly Blog. Basically, Gaby will email us twice a month with a topic idea for us to write about, with the aim of getting us to write about things which may be out of our comfort zones. As someone who struggles for ideas of blog posts that aren't just life posts, I think this will be really good, and I'm very excited to be involved! If anyone else wants to get in on the action (there are over 360 of us now!) then you just have to leave a comment on this post of hers or email anothergirlyblg@gmail.com with your name, blog URL and email address before December 9th so be quick! In other life news, I have a few draft posts nearly ready to go, and were supposed to be posted this week, however I have had the week from Hell, with two accidents on the motorway causing me to be delayed for 4 and a half hours on Tuesday morning and 5 and a half hours on Thursday night. Luckily work were very understanding about Tuesday, but on Thursday it was 10:30pm before I got home, and I was so desperate for a wee! I'm having our en suite bathroom redone at the moment as well and lots of that has gone wrong as well, so what with all of that and this being the first week without Rich, blogging kind of got put by the wayside. I promise I will return properly this week though, with my very delayed holiday posts!